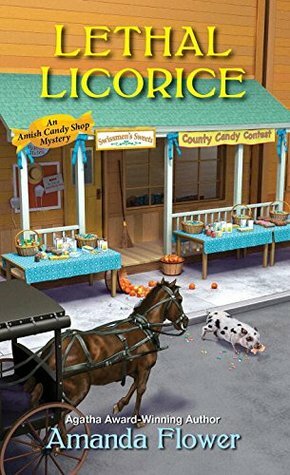 In the second book of this very good chocolate series, Bailey King is participating in the Amish Confectionery Competition in Harvest, Ohio to honor her deceased Grandfather. Josephine Weaver, another entrant contested her questions her right to complete as Bailey is not Amish. Bailey is looking for Jerthro, a missing pot-billed pig to Juliet Brody, a close for when she finds Josephine dead in the church organ. Josephine has died from a severe allergy to anise, an ingredient in licorice. Bailey is a person of interest in the death of her competitor. She becomes involved with the mystery to clear her name. I highly recommend this book and series. A recipe for LICORICE is included. Disclosure: Many thanks to Kensington Books for my copy for review. The opinions expressed are my own. This entry was posted in #NetGalley, Books, Uncategorized and tagged allergy, Amish, Bailey, cozy mystery, Jerthro. Bookmark the permalink. Thanks! You are going to like it.